From The Road to Oz, by L. Frank Baum, 1909: In which is related how Dorothy Gale of Kansas, The Shaggy Man, Button Bright, and Polychrome the Rainbow’s Daughter met on an Enchanted Road and followed it all the way to the Marvelous Land of Oz, encountering strange people and interesting adventures along the way. My father read to me and my sister Diane, and we later read for ourselves, all 14 Oz books written by L. Frank Baum. There were more written by others after Baum died, but they didn’t come up to the standard his books established, according to both Dad and me. I often think of Johnny Dooit when I am engaged in manual labor; he provides inspiration. I also learned to appreciate the value of tools and a can-do attitude through him, later buttressed by real life experiences. The first book, The Wonderful Wizard of Oz, and the unforgettable movie made of it in 1939, are essential parts of my childhood. “Somewhere Over the Rainbow,” sung by Judy Garland, never fails to evoke tender feelings in me. You can access the text of all of these books online, here. In addition to The Road to Oz another favorite of mine is Rinkitink in Oz, King Rinkitink of Gilgad is a Falstaffian character who rides a surly billy goat who talks, of course, and in a most disrespectful manner to everyone, including especially the king. There is a young man, the Prince of Pingaree, who accompanies the King to Oz, in order to escape his kingdom’s enemies and to seek help from the ruler of Oz. The Prince has three magic pearls that figure in his ability to overcome great dangers on his trip to Oz. Prince Inga’s father, King Kitticut, had told him, before the King and Queen were captured by enemies: “Each of the three possesses an astonishing power, and whoever is their owner may count himself a fortunate man. This one having the blue tint will give to the person who carries it a strength so great that no power can resist him. The one with the pink glow will protect its owner from all dangers that may threaten him, no matter from what source they may come. The third pearl — this one of pure white — can speak, and its words are always wise and helpful.” To add spice to the story, the Prince has trouble hanging on the the pearls as he, King Rinkitink and Bilbil the goat search for the the safety and the help of the Land of Oz. A major point in this book is that Dorothy Gale of Kansas is not the main character, as she is in so many others–and he is a boy. There is another book where the main character starts out, from our view, as a boy but is later transformed back into his original condition as Ozma, The Royal Princess of Oz. This occurs in the second Oz book, The Marvelous Land of Oz, the only book in which Dorothy Gale does not appear. One of my favorite characters is introduced in this second book: “H.M. Wogglebug, T.E.” whom you see lecturing the assembled characters in the image on the left. H.M. stands for Highly Magnified (he escaped from a professor’s magnifying apparatus) and T.E. means Thoroughly Educated (after all, he was a living specimen for students and therefore lived at a university). This character exhibits all the pomposity and windiness of the quintessential caricature of a professor. I think Dad and I saw ourselves in him. Dad started the tradition of collecting, keeping and passing along the Oz books to the generation that follows. Some of the books I held as a young boy (and my sister, as a younger girl) are now in the possession of my niece Vicki and her two daughters Shawna and Megan; and, also my youngest daughter Analiese and her nieces, my 7- and 11-year-old granddaughters Sydney and Sonya. As you may sense, I could go on and on about the many and surprising array of characters in the Oz books, not all of them nice people, or even people at all. I urge to read one to see if you can resist reading others, no matter what your age. 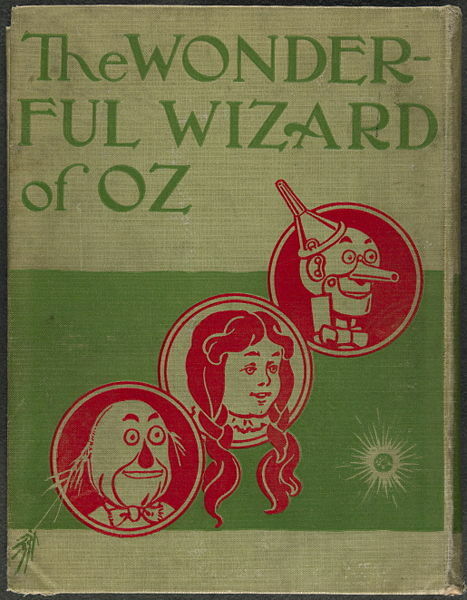 This entry was posted in Books & Literature, Books and Literature and tagged Dorothy and the Wizard in Oz, Dorothy Gale of Kansas, H.M. Wogglebug T.E, Johnny Dooit, L. Frank Baum, Oz books, Rinkitink in Oz, Road to Oz, Shaggy Man, The Emerald City of Oz. Bookmark the permalink.